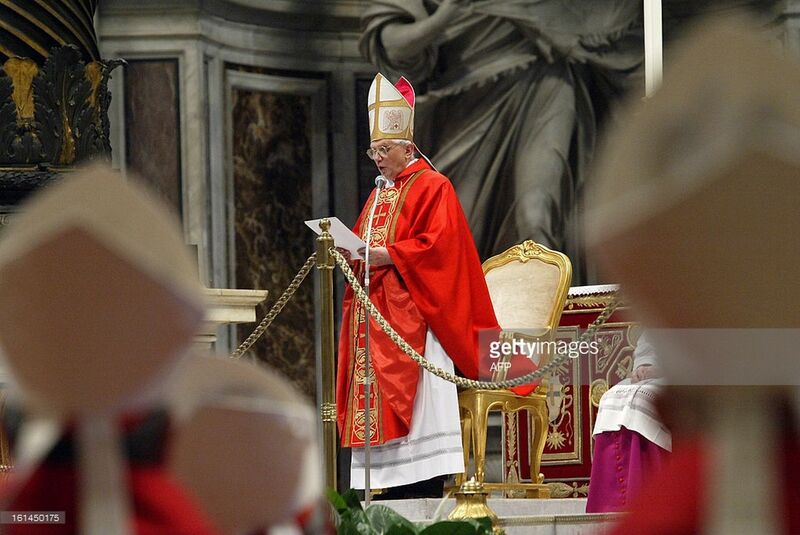 ← ONLY CARDINALS APPOINTED BY POPES Saint John Paul II AND Benedict XVI CAN DECLARE THE ELECTION OF FRANCIS THE MERCIFUL INVALID AND PROCEED TO A NEW CONCLAVE TO ELECT A LEGITIMATE SUCCESSOR TO Benedict XVI, PRAY AND WORK THAT IT MAY TAKE PLACE SOON . Why are Skojec & Siscoe Afraid of a Conclave Investigation by Cardinals? The Catholic Monitor received a comment from Steve Skojec today that was puzzling. Why is he saying “the Church teaches that it is infallible” then saying “I’m not claiming it as infallible”? Moreover, Skojec in the post says to go to Siscoe’s website which says that what Steve is saying is “de fide” (if John of St. Thomas’s explanation is correct which Skojec assumes is correct thus it is de fide or infallible) which means “doctrines of the Church which are infallibly true” according to the CatholicCulture.com dictionary. Catholic historian Carroll explicitly says that what matters in a valid papal election is not how many cardinals claim a person is the pope or universal acceptance unless it was a lawful election as prescribed by the last pope. That’s the problem with Skojec’s and Siscoe’s John of St. Thomas selective mantra about “universal acceptance” while ignoring his “lawfully elected” part of the quote. This is why Bishop Rene Gracida’s call for a cardinal investigation is important. Bishop Gracida is saying what Pope John Paul II’s conclave constitution says about the question of if Francis was “lawfully elected” or not: only the cardinals can investigate it and interpret it. Siscoe, Skojec, canon lawyers or John of St. Thomas can’t interpret it, John Paul II’s constitution prescribes that cardinals interpret it. Robert Siscoe is a heretic. He doesn’t even know how to debate the phony sedevacantist heretics from “Vaticancatholic.com” aka Peter and Michael Dimond. Any debate between Bishop Gracida and I vs. Siscoe would easily prove Sicoe’s heresies. The article they have posted below is good in refuting sedevacantism. However, he then fails to address his critics from the other side. They still refuse to face the facts about “two popes. No Pope apparently having been produced in March 2013, those otherwise valid cardinals who failed with scienter to act on violations of Chapter IV, on that account alone would nonetheless remain voting members of the College unless and until a new real Pope is elected and adjudges them. So, based on what was said and shown to the three child seers of Fatima, when taken in conjunction with what Francis has said in a book length interview re “sins below the belt” it would seem that there may be pleasant spots in hell? Francis is flat out wrong about the “lightness” of sexual sin. And therefore, a longstanding, universally accepted dogma of Catholicism has been rejected by a man thought/believed by many to be Pope. Francis may be wiley enough to not proclaim his personal ideas as new doctrine, in order to not be held to account on holding/promoting heretical beliefs. But if he does hold and promote these beliefs by proxy and/or through stealth, it is difficult to conclude or discern that he is the true Pope of the Holy Catholic Church on earth. looking to (or for) the true Head of the Catholic Church on earth (aka the Pope). And this is just one example of many statements/beliefs that have come from a man that was elected as Pope, but in a manner thought by many to be largely through the machinations of the self-confessed Mafia of “The Sankt Gallen Group”. If the validity of Francis’ election is not investigated by the appropriate Cardinals, then we are very likely in for an even rougher ride than that which has been had for six years now. If it is investigated and then ratified, I honestly don’t know what or who(m) to believe anymore. So there are pleasant spots in hell or Fatima is a lie….take your pick. There seems a small but growing number of people are willing to use the sense God gave them. It needs to be determined, in the proper manner and according to the directives put forth by Pope St. John Paul II, if the person presently sitting in Peter’s Chair was validly and licitly elected. Enough confusion has already been sown that it would seem a necessity, based on what should be the standards of any truly orthodox Catholic prelate. Is Francis’ direct contradiction of Our Lady of Fatima regardings sins of the flesh in itsekf not enough (let alone the countless other demonstrable errors in “judgdment”). Our blessed mother either appeared and spoke at Fatima or she didn’t. You can’t have it both ways and their are no cool/shady spots in hell for “light” mortal sins. The very concept is oxymoronic and a contradiction in terms. Mr. Skojec and Mr. Siscoe, actually, are abusing the authority of John of St. Thomas. The latter’s reflections assuredly presuppose due process or fulfillment of all juridical requisites before and within a papal election as a condition so that assent to its results may be given. Instead of adverting to this, Mr. Skojec and others on his site ‘beg the question’ to be demonstrated. It is not whether apparent universal assent the recent election has occurred, but rather whether such really could occur IF there were true violations of stipulated regulations currently effective in governing papal elections. There are definitely reasonable questions that have been raised based on documentation of acts and failures by several parties in the last conclave. To reject these considerations requires establishing that said acts and failures did not occur or that they did not, in any way, violate the stipulations governing a valid election. However, neither Mr. Skojec and his devotees on his rather illogical site, nor others who should do so, have done this thus far.